This is what became of my WIP last week...a little frog. He was really easy to do and came out super cute (and tiny). If you'd like to make one, the pattern is here. I may make another as this guy is on his way to becoming a Christmas gift. I did try my hand at blocking this week. I was super glad I hadn't purged the old alphabet block tiles in my basement clean-up efforts as they are perfect for this process. 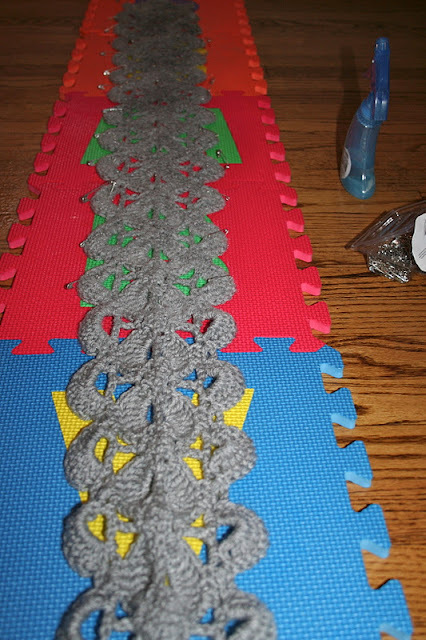 It went much better than I thought it would, but if I'm going to need to block again, I'm going to need straight pins (safety pins were kind of a pain to use). 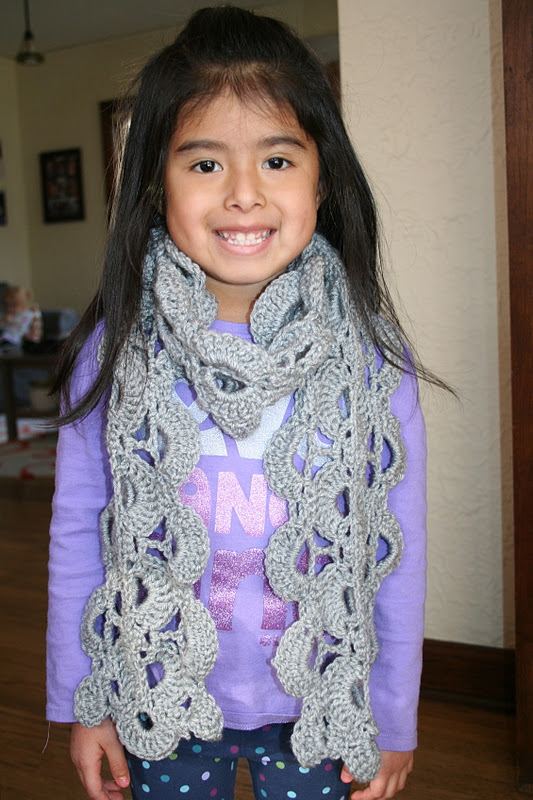 The lovely Miss EJ modeling the finished scarf. This was a really quick and easy pattern...so much so that I never had time to put it in a WIP post. The yarn is Vanna's Choice Silver Heather (2 skeins needed) which gives a somewhat heathered, somewhat shiny look. Love how it came out and can't wait to send it to its new owner! The real work in progress this week is the haul I got at the yarn sale! Each of these skeins was just $1.50! This batch is for hats, scarves, and mittens to donate to the homeless (1 hat & 1 scarf are completed to date). And this batch is needed for my Christmas projects for the kids (the 2 gray on the bottom right were for the scarf shown above). Pretty sure I need to get hooking! 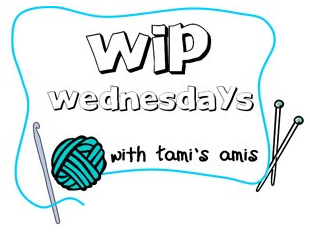 Joining up with Yarn Along at Small Things & WIP Wednesday at Tami's Amis. Now that the eyes are on, it's undoubtedly a frog. Looks great! I like the scarf, very fashionable. And you have top-notch models! What a great scarf- and love the frogs. Fantastic deal you got on the yarn! 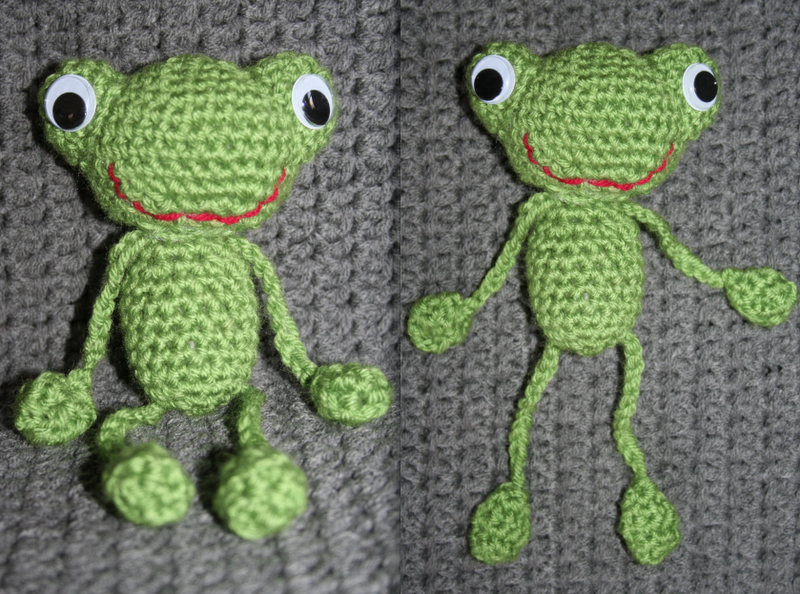 the froggy turned out super cute! good color too :) looks like you have your work cut out for you but then again you wouldn't be you if you didn't have a million projects in the works :) happy crocheting!! Those froggies are adorable! Great score at the yarn sale! Froggy is so cute!! I ended up making the trip to Michaels for a large amount of Vanna's Choice too. It was too good to pass up that deal! Okay, I thought the frog was pretty cute... until I scrolled down to your scarf model -- she's adorable! 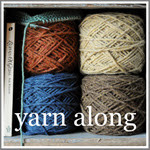 Congratulations on the epic yarn score, and have fun knotting all of it up! Oh my goodness that little frog is super super cute! I love it!! Oh and major yarn envy here, lots of gorgeous yarn! Love that color on EJ! Simply beautiful. The frogs are cute, but your scarf model is beautiful! love the frog. And the scarf. And All. That. Yarn! Lovely frogs, pretty scarf, fabulous bargains, but your model - absolutely gorgeous!! That scarf is so beautiful! What a great pattern.